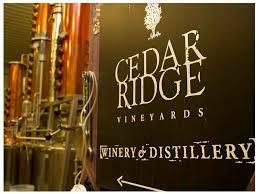 Cedar Ridge Distillery is Iowa's oldest & largest whiskey producing distillery in the state. Cedar Ridge whiskey is for the explorers, aficionados, and connoisseurs that want more authenticity and a personal-human connection when it comes to their whiskey drinking experience. Cedar Ridge, Iowa's first distillery brings you the best Midwest whiskey from America's beloved grain belt. Whether you are after a bottle of coveted Silver Label Single Malt or Multi-award winning Iowa Bourbon Whiskey, Cedar Ridge whiskey will be your drink for celebrations, rough days, and any day in between. We know that many people think of Iowa as just having corn – we're perfectly fine with that. That means that we have the benefit of having the best product to make the best bourbon– Iowa Corn. Fine craftsmanship is a true reflection of Iowa's mentality, where we do the best with what nature gives us, while maintaining minimal waste. The best corn and grains come from the most fertile soil found right here in America's Grain Belt.